American households really took a hit in the third quarter of 2008. Federal Reserve released its third quarter Flow of Funds Accounts of the United States today. According to the report, U.S. households lost $2.8 trillion in value from July to September to a total of $56.539 trillion. That’s a 4.7% decline from the second quarter. But this is not the first quarterly decline this year. In fact, U.S. household net worth has been shrinking since the four quarter of 2007, when the current recession began. 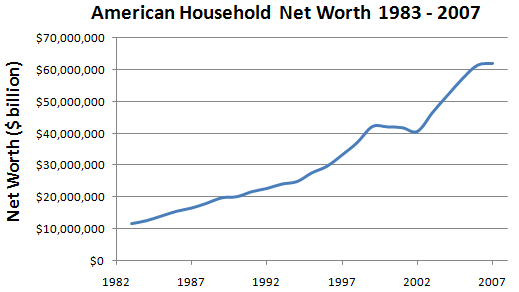 Household net worth peaked in the third quarter of 2007 and has been declining since then. For the first three quarters of this year, Americans have lost a total of $3.2 trillion, most of that in the third quarter. As the above chart shows, during the last recession, household net worth also declined for three straight years after peaking in 1999. How long will this one last? Not all number in the report are bad, though. For example, the report says that for the first time ever since the Fed started tracking in 1952, household debt actually declined by 0.8% last quarter to a total of $13.91 trillion. So people are really cutting back.